The European Commission’s mid-term review of the Capital Markets Union Action Plan shows it is serious about sustainable finance, but more remains to be done, write Christian Thimann and Steve Waygood. Christian Thimann is senior adviser to the chairman at Axa and Steve Waygood chief responsible investment officer at Aviva Investors. 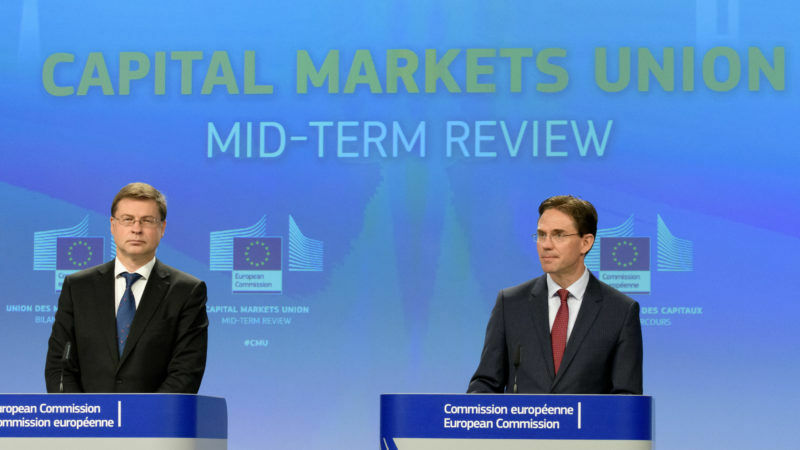 On 8 June, the European Commission published its Midterm Review of the Capital Markets Union (CMU) Action Plan, an initiative designed to revamp European markets to ensure they are deeper, better integrated and more robust. One of the key priorities identified in the review is to channel more private capital towards sustainable investments. That sustainability lies at the heart of the CMU project reflects the input of the High-level Expert Group on Sustainable Finance, a committee of 20 policy leaders from finance, academia and civil society appointed by the Commission in December 2016. Both Axa and Aviva are represented in the group and we are pleased the Commission has taken our proposals into account. The mid-term review proves the EU is ready to show global leadership on environmental, social and governance (ESG) issues. However, more needs to be done to ensure the CMU plan provides the foundations for a truly sustainable financial system. Specifically, the High-level Expert Group believes further action in five areas will be vital. Firstly, we would like to see better disclosure on ESG-related matters among financial-market participants. The Commission has recently published guidelines that will help companies comply with existing EU non-financial reporting requirements, which is a positive step. But we believe the Commission should go further and engage with the work of the Financial Stability Board’s Task Force on Climate-related Financial Disclosures (TCFD), an initiative designed to encourage a range of capital-market intermediaries to provide more information on their exposure to climate risks. As members of the FSB Task Force, we would like to see the Commission push for its recommendations to be taken up across the European capital markets. Second, ESG should be incorporated in credit-rating methodologies. Currently, a typical credit rating only gives a detailed picture of an institution’s creditworthiness over a time horizon of about three years, even if it is issuing a bond that matures decades hence. Ratings that incorporate ESG criteria will furnish investors with a more holistic, longer-term view of a company’s prospects. Furthermore, credit ratings are central to how financial markets are regulated: ratings are part of the legal framework that governs banks’ capital-adequacy provisions and the Solvency II legislation for insurers, for example. We believe incorporating ESG into ratings will strengthen these regulatory regimes and help insulate markets against longer-term social and environmental shocks. Third, sustainability and ESG should be more fully integrated into supervisory processes. The High-level Expert Group would like to see the European Supervisory Authorities (ESAs) play a central role in this. Inaction on sustainability issues is widely acknowledged as a significant systemic risk; as such the ESAs should be addressing it as part of their existing mandates. However, over the longer term, the Commission could empower the ESAs to more effectively promote supervisory convergence on ESG issues by coordinating the work of national authorities. We believe the ESAs should take steps to leverage the final recommendations of the FSB Task Force to encourage standardised disclosures on climate-related risks, for example. Fourth, we would like to see the Commission ensure sustainability is incorporated in the investment mandates of institutional investors and asset managers. Key to this process will be clarifying the fiduciary duties of these organisations. Research shows many investors, directors and pension trustees are still under the impression that fiduciaries are required to focus on maximising short-term returns and that sustainability is an irrelevance. This is false. Under the existing rules, fiduciaries have a duty to act with due care, skill and diligence; investing as an ‘ordinary prudent person’ would do. An ordinary prudent person would not ignore climate-related risks; that much is clear. But we believe fiduciary duty runs deeper than this. Would a prudent person like to see their money used to despoil the planet or exploit their fellow human beings? By clarifying that fiduciary duty should encompass these broader considerations, the Commission could encourage investors to listen to their clients’ views on these matters and deploy their capital more sustainably. Finally, sustainability considerations should be taken into account in upcoming reviews of financial legislation. The existing ‘SME Test’ may provide a useful model for this. The SME Test encourages EU countries and institutions to assess the potential impact of new legislation on small- and medium-sized enterprises before enacting it. In a similar vein, we propose that a ‘Sustainability Test’ should be introduced to measure the potential impact of new laws on the environment and wider society. The Commission has pledged to act on each of these issues as a matter of priority, and we look forward to working with it to ensure these proposals are taken forward. On 18 July, the High-level Expert Group released its interim report, which lays out the further steps we would like the Commission to take to incorporate sustainability into the CMU plan – and ensure it delivers a greener, more sustainable future for Europe.